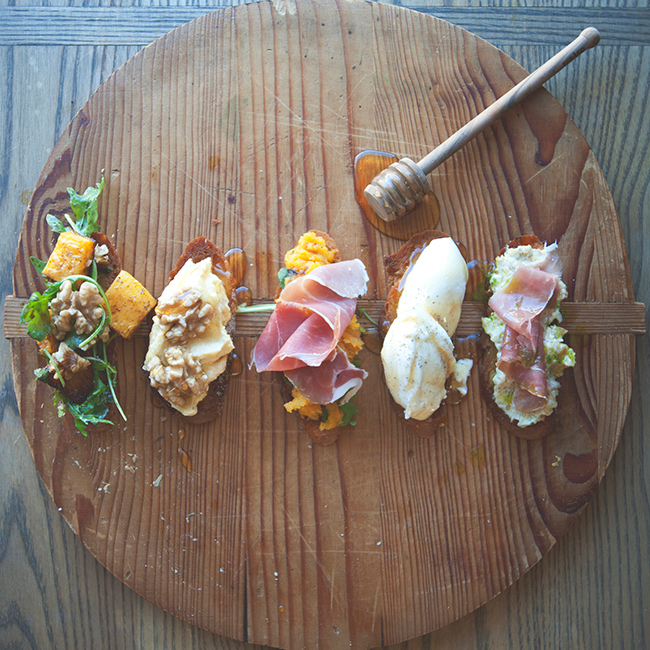 Five ingredients, five different apps. It’s a simple concept, and the perfect idea for holiday parties. Few things makes me happier than standing in front of an impressive spread with the knowledge that it didn’t take a lot of time, assembly, or stress. For these crostini, I have five basic ingredients that you can switch out easily: a roasted vegetable, toasted nut, cured meat, soft cheese, and a leafy green. Mix in your favorites to this flavor palette for a customizable, inexhaustible supply of party snacks. Coat the butternut squash with olive oil, salt, and pepper. Roast for about 20 to 30 minutes, until tender and golden brown. To get it extra crispy I like to broil them for a minute at the end. In a bowl, combine the roasted butternut squash, a big pinch of chili flake, a few tablespoons of olive oil, and if needed, salt and pepper. With the back of a fork, smash the butternut squash roughly. Don’t overdo it though, it should still have some structure. 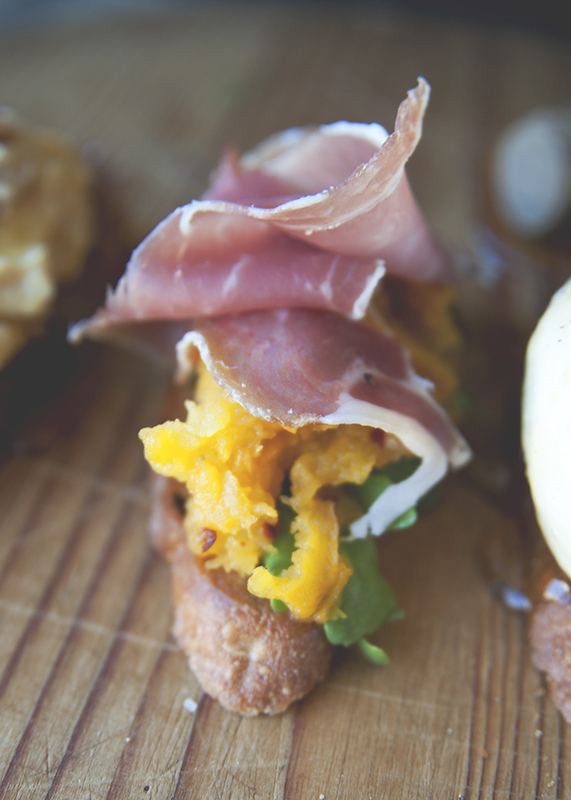 Lay a few pieces of arugula on each crostini, then spoon on some of the smashed butternut squash. Top with prosciutto and garnish with olive oil. In a food processor, puree the roasted butternut squash and ricotta, seasoning with salt and pepper. Spoon on top of each crostini. Garnish with a few pieces of walnuts and a drizzle of honey. In a food processor, puree the walnuts, ricotta, and garlic together, drizzling in a little olive oil at a time. Season with salt and pepper. Spoon on top of each crostini. Top with a slice of prosciutto. To make the arugula oil, combine the arugula with about 3/4 cup olive oil in a blender or food processor. Add a pinch of salt. Blend until very very fine, and strain. Drizzle the arugula oil over the crostini. 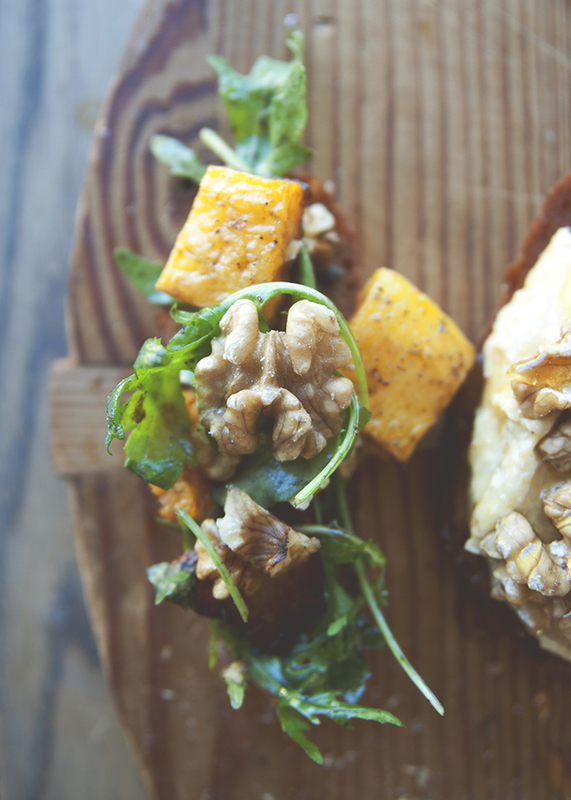 In a bowl, combine the roasted butternut squash, arugula, walnuts, a few tablespoons of olive oil, a tablespoon of vinegar, and if needed, salt and pepper. Toss with your hands or a spoon. Spoon some of the salad onto the crostini. Top with a touch of balsamic. 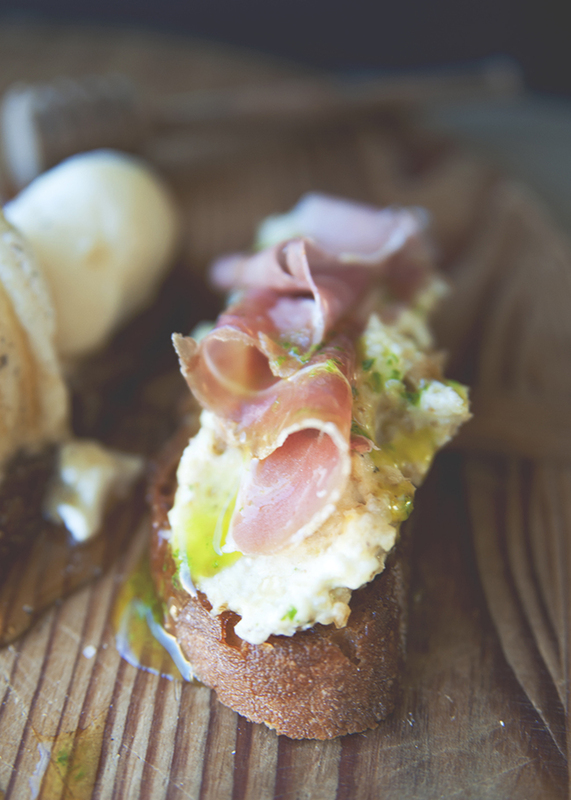 Spoon some of the ricotta onto the crostini. Top with a touch of honey and black pepper.